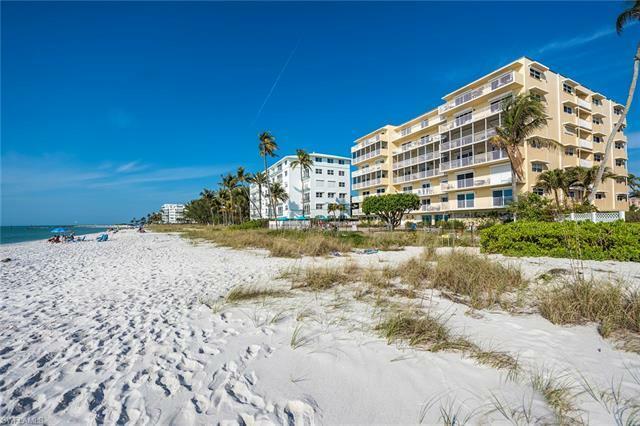 Once upon a time, there was a buyer searching for a perfect Naples condo on the Gulf of Mexico, with amazing views of the rolling waves and the sun-kissed beaches. Well, that once upon a time has truly arrived, and the location is within the stunning Gulf Towers. This elegant coastal 2 BR/2 BA condo exudes whimsy and magic; a place where fairy tales are woven; a place where your imagination can soar upon the wings of the gulls and osprey. Designer furnished and accessorized by MacKenzie-Childs, this spacious residence is offered turnkey for your comfort. A Koi pond within lush botanical gardens initially welcomes you to the building. The renovated lobby foyer and community room exude a coastal vibe, leading to this corner-unit #201. An updated kitchen and expansive great room entice with spectacular views of the coast, beckoning a moment to pause and step outside to the large open-air lanai as you gaze in awe while listening to the rhythm of the Gulf. The master bedroom with en suite bath also embraces the western majesty of the Gulf with large high-impact sliders, and the guest bedroom continues not to disappoint with southwesterly Gulf views. Dreams really do come true!